Administrators have been called in at a multi-million pound arts centre being developed in the Black Country. 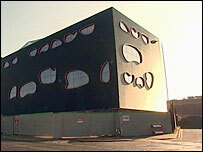 The Public, in West Bromwich, was scheduled to open in July but it is has debts and other funding issues. Bosses said they had no choice, but are doing everything they can to secure its future as a venue for theatre, music, dance and creative technology. Work has been halted on the building until financial problems can be sorted out, putting about 81 jobs at risk. The arts centre's launch date has now been put back until this autumn. In a statement its chief executive Sylvia King confirmed it had filed a notice of intention to appoint administrators at court. "Our trustees have been working extremely hard with our executive team to resolve with the funders the range of issues that face us," she said. "The trustees finally had no alternative but to take this route. "Our goal is to ensure our community art work is living and breathing both in the public building and around it. "We will be working closely with the administrators and all parties to do everything we can to secure the future of The Public." A spokeswoman said there is a risk of redundancies but a decision will not be made until the administrators arrive.